Russell Finex provides fine mesh separation technology, with 80 years’ experience of designing and manufacturing sieves, separators, self-cleaning in-line filters, and ultrasonic systems. For many years Russell Finex has been an integral part of the food industry, not just as a supplier, but also as an innovator and advisor. The company has years of experience with a wide range of food ingredients, from apple juice to nuts, coconut to spices, flour to sauces, rice to bran, and hundreds of others, each with their own particular problems. Russell Finex has extensive experience in dealing with the problems related to hazard analysis critical control point (HACCP) and hazard analysis operational studies (HAZOP). 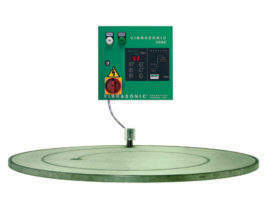 The company also understands the needs of the European Comission (EC) Official Controls of Foodstuffs directive, the UK Food Safety Act, and good manufacturing practices (GMP), as well as US Food and Drug Administration (FDA) and US Department of Agriculture (USDA) requirements, which all create a need for specialised food sieving equipment and expertise. 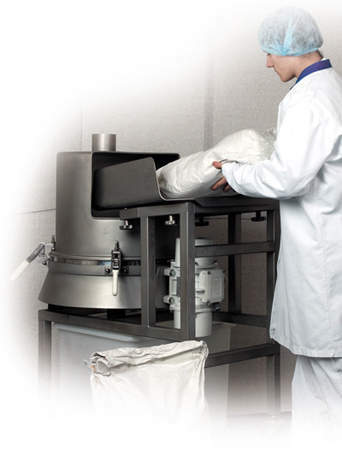 The Compact 3in1 Sieve™ is specifically designed to check screen hand-fed ingredients through low-level bag emptying, where operator protection is essential. 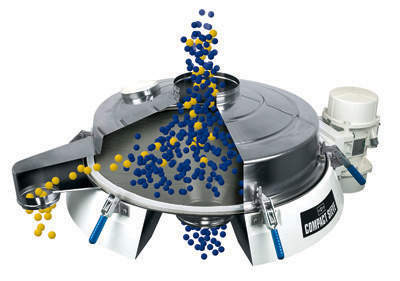 Due to its straight-through design and optimum clearance between the sieve outlet and your floor, the 3in1 Sieve™ can fit neatly into your production process. 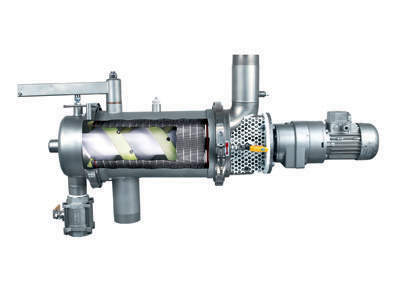 Russell Finex’s self-cleaning in-line filters are ideal for removing oversize contamination from liquids and provide consistently high flow rates with no operator control necessary. As they do not require filter bags or cartridges and significantly reduce wasted products, the company’s in-line filters are both cost-effective and environmentally friendly. The filter range includes vertical, horizontal, in-line, on-line, and high-temperature / jacketed filters, as well as the Filter Management System™. Grading / sizing of powders and granules achieves separation on different ranges of particle sizes. Grading machines separate up to five product fractions, increasing sieving accuracy and efficiency, and include the Finex Separator™, Russell Eco Separator®, and the Finex range. Also known as safety screeners or control sieves, check screeners ensure that the correct product quality of powders or liquids is achieved by removing oversize contamination. Products in Russell Finex’s check screener range include the Russell Compact Sieve®, the Blow Thru Sieve™, and the Mini Sifter™. Innovation is at the core of Russell Finex’s business, and the company is continually developing its range of sieves and filters along with its manufacturing procedures to satisfy the demanding requirements of the food and pharmaceutical industries. With companies in the UK, the US, and Belgium, as well as a strong network of experienced agents and distributors worldwide, Russell Finex’s equipment is engineered for a global market supplied to over 140 countries. As part of the company’s continued aim to supply good quality honey, Norwegian-based distributor Honningcentralen previously installed a metal edge industrial filter into its new production line to remove foreign bodies from the honey such as wax and bee wings. However, this filter was inefficient, continuously requiring manual cleaning resulting in production downtime. Mondelēz International sought to optimise the production process of one of its well-known brands and looked to existing sieving and filtration supplier Russell Finex to provide a solution. When Clipper Teas was searching for a new loading and screening system, Russell Finex provided the ideal solution. Multinational confectionery, food and beverage manufacturer Mondelēz has installed the Self-Cleaning Russell Eco Filter® to improve its production process and recover caramel. One of the main production activities of Eco Treasures is the ecological extraction of essential oils from residual vegetable feedstock and fine fruit seeds. To satisfy increasing market demands, raw bakery ingredients manufacturer Zeelandia sought to optimise product quality, improve productivity and reduce downtime. Ready meals have become a major part of the modern-day food industry. To meet the needs of modern society, where work and social demands have meant a sacrifice on meal times, food producers are continually improving ready meal production lines, creating appetising foods that can be prepared in minimal time. With a continued commitment to developing operations and a change in society for a healthier lifestyle leading to increased demand for milk powder products, Nestlé has invested in a new factory in Osorno, Chile. Milhans Gida ve Tarim Urunleri (Milhans) is a producer of high-quality nut products and a major manufacturer of private-label products to some of Turkey’s largest food retailers, as well as supplying its own range of snacks. Viscous food pastes and liquids such as honey, liquid chocolate, nut pastes and oils must be screened before use in food production. Food consortium Consorzio Latterie Virgillio reduces, recycles and repurposes waste by producing biodiesel from animal fat. Haitoglou Bros is a global leader in the manufacture of sesame seed products, including tahini paste. The company processes up to 150tn of sesame seeds a day at its modern production facilities in Thessaloniki, Greece, and supplies its premium range of products to a global network of customers. Russell Finex's industrial filter helps Mondelēz improve their production process by recovering liquid caramel at a high temperature. With factories or operations in almost every country, Nestlé is one of the world's leading nutrition, health, and wellness companies. Since Nestlé first began selling in Chile in 1934, the country now provides one of the highest-per-capita consumption and sales of its products. Colman's has installed two Russell Compact Sieves to safeguard high-quality standards at Norwich manufacturing plant. Avoiding product loss through efficient production is essential and in confectionary manufacture, raw materials such as sugar are often reclaimed. With the installation of Russell Eco Self-Cleaning Filters® and Compact Sieves®, Russell Finex helped Godiva reach the highest quality standards, delivering maximum customer satisfaction every time. With the demand for food regulation and certification constantly growing, companies are continually looking for new ways to increase their screening output. A new range of high capacity self-cleaning filters, designed to provide high volume and continuous production, has been added to the award-winning, high performance self cleaning Russell Eco Filter range. Clipper Teas is a leading manufacturer of green, white and black teas who produce 7,000kg - 8,000kg of tea per day. Russell Finex has announced that it has been selected to represent the manufacturing industry in this year's Parliamentary Review. 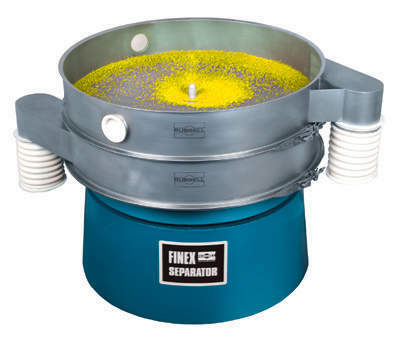 The Finex Separator accurately grades reusable chocolate brownie pieces into two fractions. Russell Finex specialises in the sieving of powders and handles a wide range of liquid applications. Russell Finex has been innovating processing technology since 1934. 2014 marks 80 years of growth and excellence.